Teaching has been my passion, joy and fun in life. development of the human person. 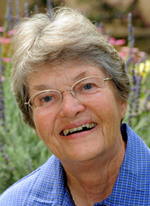 Sister Betty Shields, (Sister Michele Therese), began her forever journey after a noble battle with cancer at Our Lady of Fatima Villa, Saratoga, California. Sister Betty’s life was characterized by her gentleness, unfailing trust in her God and love of children. She was 74 years old and celebrated 53 years of profession as a Sister of the Holy Names of Jesus and Mary. Sister Betty was an educator par excellence. From inviting children at Casa Maria Montessori (Los Gatos) to find their “heart space”, to the profound respect she showed to each person, Sister Betty was able draw out the best and the holiest in each child and each person she met. She was an educator of educators, mentoring numerous teachers with her wise teaching methodologies. She shared her presence and gifts at Saint Anselm (San Anselmo), Saint Clement (Ocean Park), Saint Cecilia (San Francisco), Saint Mark (Venice), Casa Maria Montessori (Los Gatos), Saint Stephen (Monterey Park), Saint Theresa (Oakland), Saint Bede (Hayward), Saint Theresa (Alhambra), Saint Christopher (San Jose) and Saint Mary (Los Gatos). She is survived by her brothers, John (Vui), Tom (Claudia) and Don, and her sister, Mary Harkins, and many nieces and nephews. She is remembered with great love and respect by the Sisters and Associates of the Holy Names. The Mass of Resurrection for Sister Betty will be on Thursday, October 12, 2017 at 3:30 pm at Saint Mary Church, 219 Bean Ave, Los Gatos, CA 95030. Her burial will be at 10:15 am on Friday, October 13, 2017 at Holy Sepulchre Cemetery, Hayward, California. Gifts in her memory may be made to the Sisters of the Holy Names, P.O. Box 907, Los Gatos, CA, 95031 or on-line at www.snjmca.org.